For a few weeks I noticed my toilet had begun to make a whistling noise while flushing. I figured something was not right so I looked it up online. Based on the information, it looked like it was the fill valve that was making the noise while refilling the tank. These are pretty cheap so they recommend replacing it if it is making a whistling noise. I had installed this fill valve about 4 years back and I still had the original box. It was a Fluidmaster Complete Kit and I noticed there was a 5 year warranty on it. Since it was within this time, I figured I would contact them to see if I could get a replacement part. I found the email contact online and explained the issue. I expected to get a reply about how I would have to mail in the original receipt and the defective part. You know, a difficult process that would make it not even worth the hassle, but to my surprise, almost immediately, I received a response from Fluidmaster saying they would send one out, all they needed was my address. Great! So I provided them with the info and within a few days a new replacement part showed up! That is what I call great service! So I go to install the new part. I figured it would be pretty easy based on the instructions. I turned off the water supply and drained the tank. I used a sponge to get all the extra water out and cleaned out the tank in the process. Next I started to unscrew the old fill valve. At first it was going ok, but then it got stuck. I found out later that you have to unscrew the water supply part first, then unscrew the fill valve from the tank. I did it in the reverse order so they ended up getting stuck together. I could not budge them one way or the other. Luckily there was a handyman in my building who had some specific tools to help get them unstuck. He came by to help remove the old fill valve and install the new one. So now it is good as new and does not make a whistling noise. 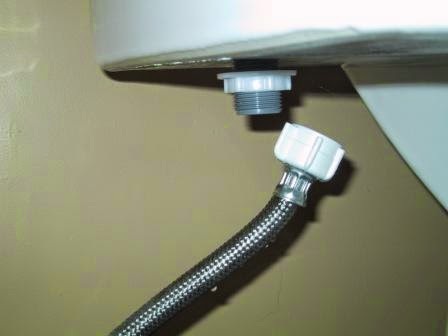 So if your toilet is whistling, chances are it is the fill valve. If you are going to install a new one, check the warranty on the old one. Also make sure to unscrew the water supply part first before unscrewing the fill valve from the tank. I live on the 4th floor of a 15 story co op building. I live here almos 2 years and went through 3 toilet tank valves. they will start whilsting, I turn down water valve and then I get vibration. I was told it might be caused by to much water pressure. anyone have any suggestions on how to remedy this or how to measure water pressure? I would appreciate it. Thanks for the walkthrough. I'm doing this for the first time and never would have thought to unscrew the water supply feed first. My (3) toilet(s) are whistling alright- so I've called Fluidmaster in CA for advice. They suggested just to go and buy a new model 400A for $7 (only) each and replace the defective units. The valve now comes with a 5 year warranty. (The original that came with my toilet several years ago, had only 1 year warranty- they said that those units have a defined, and limited, lifetime). Wonderful advice, thanks so much!